Three attempts at the perfect blend (we’ve eaten a LOT of chicken this week), before coming up with our final version. We even conducted a side-by-side comparison of our version vs. this recipe’s inspiration…Mardi Gras Wings. I think we’ve nailed it. Down. 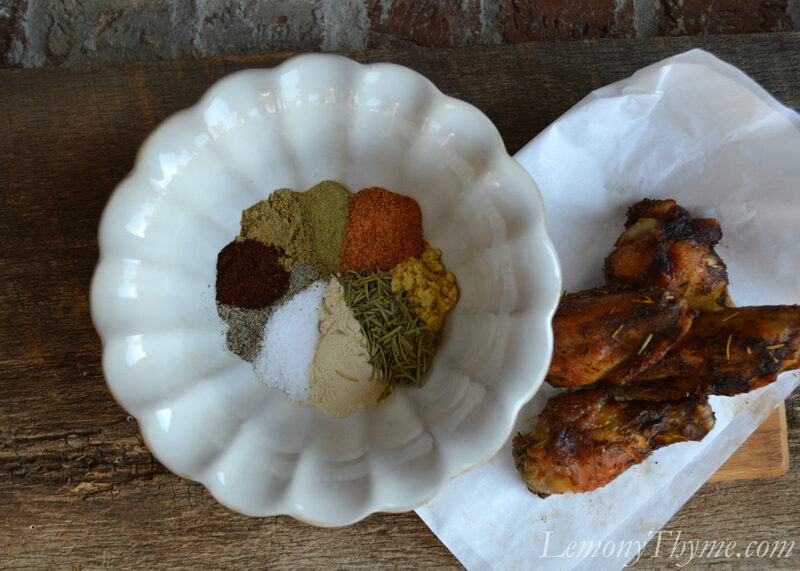 If you’re not familiar with Mardi Gras Wings, the flavor (and amazing aroma) features rosemary. However by no means does it stop there. The taste is spicy, as in lots of spice flavor, with just a subtle salty heat. Combine the spice blend with 3 Tbl. canola oil to make a paste. I found this worked better than a dry rub method. Once you’ve rinsed and thoroughly dried the chicken, generously coat the bird with the seasoning paste. Place the chicken on a rack in a roasting pan. For as often as we roast chickens, I love these disposable pans. They cost less than a dollar each when bought in bulk at our wholesale club. Tie the legs together with butcher’s twine. Add 2 cups of chicken broth to the bottom of the pan for basting, this helps keep the bird moist and gives you a fabulous base for the Homemade Chicken Broth you’ll be making later. We begin roasting at 425 degrees for 30 minutes or until nicely browned. Then reduce oven temperature to 350 degrees, tent chicken with foil and bake an additional 60 minutes or so depending on size. If your chicken has a pop-up timer, trust it. Always allow your roast chicken to rest at least 15 minutes….30 is even better. This keeps all those yummy juices in the bird and not on your platter. Mardi Gras Whole Roasted Chicken, glad to have you added to our roast chicken rotation. You’re a keeper. Rinse and thoroughly dry chicken. Reserve gizzard pack for making broth later. Combine spice blend with canola oil to make a paste. Generously coat entire chicken with paste. Place on a rack in a roasting pan. Tie legs together with butcher's twine. Add 2 cups of chicken broth to the bottom of the pan. Bake at 425 degrees for 30 minutes or until nicely browned. Gently baste chicken with broth from pan (careful not to disturb spices). Reduce oven temperature to 350 degrees and tent chicken with foil. Continue baking for an additional hour or until chicken is done (juices run clear and thermometer inserted into the inner thigh registers 165 degrees). If your chicken comes with a pop-up timer trust it.. Remove chicken from oven and allow to rest for at least 15 minutes, 30 minutes is preferable. Love this recipe!!! Will try this on a slow cooker pork loin.